The assignment is based on the risk of auditing of BSF Ltd. an Australian company. The Bio-sustainable Feeds Ltd. is a company, which researches on aquaculture feeds for two decades to discover sustainable aquaculture feeds. Aquaculture is a method by which feed can be converted into protein, which is needed to survive the farmed animals. Their research is mainly focused on plant-based feed. Before this, it was fish based feed. By converting their type of feeds they are facing issues like social and environmental. They again have started research on usage of bacteria in producing fish feeds true overcome issues. Their research and development is effective for their profit and rich people are benefitted by this but poor people are not benefitted. Their products become cause of malnutrition for the poor people. Different kinds of risks are estimated and auditing is need for this company. The Audit Risk Model (ARM) is to be analysed to discuss acceptability of auditing firms to do their audit. According to Griffiths (2012), ARM is the model of detecting the audit risk for an entity and acceptability of acceptance level of audit risk by the auditing firm. The analysis of environmental and social effects of their new product is done properly. 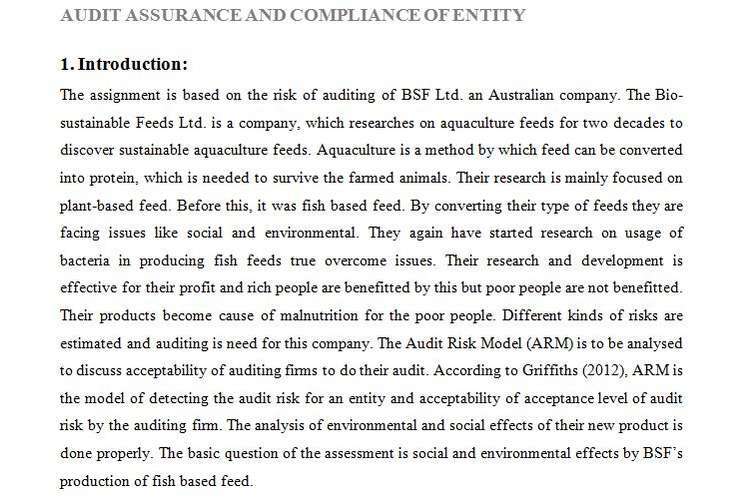 The basic question of the assessment is social and environmental effects by BSF’s production of fish based feed. To start an audit establishment of good relationship between clients an auditor is very essential and it is done by asking appropriate questions to the clients. BSF Ltd. Company should select those clients who are reliable with their ethical requirements. Step one: If a company fails to choose right client they may face financial losses and damage of reputation. The company should consider the circumstances when it accepts a new client or decides to continue with an existing client. Step two (Ethical and legal consideration): BSF Ltd. expects that their client should maintain same ethics as it has. The quality and behaviour of integrity should be matched with the client. The threats of risk may arise if the audit company’s member has shares in the clients. Then client should not be turned down, rather reduction of threats must be done at an acceptable level. Another ethical matter is conflict of interest. The letter of professional clearance is required to accept the new clients. Step three: If the client is specialised in a particular industry the auditor’s performance of competency should be evaluated. The matters of location, resources needed to perform a task, deadline of completion of a work should be focused. Step four: Resources of audit should be maintained if auditing is done with a large group of industries. Rahman (2014), stated that the practice of low balling, in which audit fees are deliberately understand in order to win new clients, is believed to weaken auditor independence. In this case pricing behaviour should be avoided. The auditor should be dynamic and process of audit should continuous in nature. Step five: The continuous auditing gives a proper level of control. Before choosing a client integrity with client is very important thing. Step six: If the client is changing the CPA firms frequently, it is important to notice the client’s behaviour, ethics from the previous CPA firms. The qualification of stuffs is also important to choose a client. Before accepting, the client following should be considered. The CPA firm is experienced and expertise about the service that the client is required. The service is related to the vision and objective of the auditing firm. The firm’s professionals and resources are sufficient to meet the requirement of the client. Step seven: Not only business ethics and decision making of the client is considered but also other things are to be considered before choosing. The company’s financial condition, whether it is in risk of loss or incurring loss that should be considered. The BSF Ltd. is suffering from collapse of $120 million AUD and their research is failed to succeed. The present and future business regulatory environment should be considered. Revenue earned by the entity and present market participation is very important. While choosing highly risky client, the survey of bankruptcy proceedings, tax lines, judicial structure, criminal records and verification of credentials, employees’ history is very important (Stuart, 2012). Step eight: The firm should expand a checklist of client acceptance and review this to record the decision-making process. Checklist identifies the firm’s important consideration and supplies the written record of prospective clients and the reason to accept them. Foreign clients can arise the problem of sudden risk and other legal concerns. Audit risk is defined as the auditor’s risk which states unsuitable audit opinion when the financial statements are misstated materially (Brasel et.al, 2016). This is different from the business risk, which is related to risks caused by effects of events, circumstances on the business objectives. Audit risk is related to assertions. Classes of transaction, accuracy of auditing are the statements. Valuation and allocations are important. The other issues of risks arise if the company owns different sites and instantaneous inventory counts. Inherent risk occurs due to error on financial accounting because of failure of control. The transaction of a company when becomes complex, inherent risk occurs. This type of risk represents a worst condition of an organisation, as all the controls seem to fail. In review of financial statement, the auditor must try to find the inherent risk. The organisation faces this risk due to dysfunction of audit department. Factors related to inherent risk are, nature of activity, regulatory body, degree of estimates, reporting of the financial statements and the areas that is responsible for mismatches. The complex transaction is the main cause of occurring this risk. In BSF Ltd. the inherent risk is 90%. This risk can be controlled by the clients as the function of type of business, liquidity degree and complexity (Tsai et al. 2013). Control risk is the failure in operation of major controls of the company. It is the misstatement of material. To detect fraud and malpractices the appropriate internal controls should present in a company. Here control risk is 5% in the given case study. It should be also controlled by the clients according to their effectiveness in preventing, detecting and occurring of system error (Viegas et al. 2013). Detection risk arises if the auditor fails to detect the material statement in financial statement properly. If an auditor applies a critical procedure of audit then the detection risk may occur but it can be reduced by raising the sampling number of transactions. BSF has 80% detection risk and this risk is controlled by the auditor according to the function of audit process applied (Vinnari & Skærbæk, 2014). It must be higher than the audit risk. The main question is raised here, whether the auditing firm does audit or not. The audit risk is calculated by multiplying inherent, control and detection risks. Auditors use Audit Risk Model (ARM) to manage the risk of auditing in an organisation. Auditors examine inherent and control risks to understand the environment of the entity. Detection risk is considered as the residual risk after considering two other risks. Here, in this case, coherent and detection risks are high but the control risk is low. The auditor set the detection risk low when other two are high. Audit firms accept to do audit when an entity has audit risk below 10%. Bio-Sustainable Feeds Ltd. has audit risk 3.6%, which is below 10%. The audit firm accept to do the audit for this entity. Substantive test of auditing is a method of testing financial statement and their supporting documents to check errors. To check the accuracy, completeness and validity financial statements this test is very efficient. This type of testing can be done by the internal audit stuffs also. To carry out this test, auditor considers that the figures used in the financial statements are related to the source documents. According to Coetzee & Lubbe (2014), substantive tests therefore include analytical procedures in addition to the four classes of audit procedures available for testing controls, so giving the well-known mnemonic AEIOU: Analytical procedures, Enquiry and confirmation, Inspection, Observation, RecalcUlation and reperformance. If test of control fails to work then substantive tests are used. The test of control is done by the stuff at the company’s client. This test involves client’s controls performed during the year. According to Coetzee & Lubbe (2014), it tests the effectiveness of controls used by the entity to prevent material miss assessment. Risk appetite should be raised to get5 risk tolerance. The strategies help to determine adequate balance between growth, risk and return (Christiaanse, Griffioen & Hulstijn, 2015). Financial statements, which are materially incorrect, those risks of entity are called audit risk. The firm, who performs audit, are legally liable for the audit risk. The audit risk arises due to error in auditor’s inventory counting procedure. BSF Company spends $500 million AUD in research of alternative fish feed and $200 million AUD in development programme. Research and development helps this company to introduce plant based fish feed and gain more profit by this type of fish. The monetary value of plant-based fish is very high and it is treated as luxury good in market. Research and development in an aquaculture firm should focus on nutrition, aquatic physiology, bioscience, coastal study, fish pathology, fishery etc (Alles, Kogan & Vasarhelyi, 2013). The aim of research program is to benefit the stakeholders of the organisation and their consumers. Their research was first focused on transforming the herbivorous fish into carnivorous and then they focused on to convert the fish feed into bacteria based without a fishmeal. They started their research on Atlantic salmon. Their industry is based on Tasmania, Victoria and Southern Australia. Plant based feed’s benefit is found by their first half research. Though it is profitable, it affects the health of society and pollute the environment. Then they focused on research of phototrophic bacteria to use it as fish feed. They need R&D programme for increasing demand of seafood in Australia and globally. The production of sea foods mainly fish has to be grown rapidly. Liu (2015) stated that, Fish feed is very costly and by feeding this weight of fish cannot be grown rapidly but plant based fish is highly weighty and high in price. Plant based feed is lower in cost than fish based. High dietary protein and lipid specifications required for the Atlantic salmon fish but using land animal protein in fishmeal is banned (Trieloff & Buys, 2013). Therefore, Alternative source of protein is required to find. The source of revenue of R&D for BSF Ltd. Company is Commonwealth Scientific and Industrial Research Organisation (CSIRO). The organisation has so many projects, among them farming and food production is an important part. The aquaculture is a sub part of this. It provides grants to BSF associated with Australian government. They also provide more grants in research to produce healthier foods. Main source of R&D cost is CSIRO for BFS Company. The CSIRO’s grant was received in the bank account and the obligations pertaining to the grant were fulfilled by BSF Ltd. during the three years. The accounting treatment of the Grant received from CSIRO have been accounted for in the books based on the AASB 120 Accounting for Government Grants and Disclosure of Government Assistance. In the present case of BSF Ltd, the grant shall be treated as other income and any expenses made with respect to the obligation shall be accounted through the profit and loss account of the company. In the above calculation, the allocation of the expenses with respect to capital and revenue nature has been assumed in 3:2 ratios. Therefore, the Grant from CSIRO of AUD 500 million is assumed to AUD 300 million for capital expenditure like plant and machinery etc while the remaining AUD 200 million has been assumed as revenue expenditure for the day-to-day operations of the company. The major concern for the auditor with respect to the full set of journal entries of the R&D transaction between three years would be the treatment of the grant in adherence to the accounting standards. The treatment of the grant from CSIRO as mentioned earlier has adhered to the AASB 120 Accounting for Government Grants and Disclosure of Government Assistance. This adherence of the accounting standard ensures true and fair accounting treatment thereby, reducing the concerns of the auditor (Zadek, Evans, & Pruzan, 2013). However, there may be concerns with respect to the allocation of the R&D cost for the revenue expenses and capital expenses. The allocations are based on the assumption, which may vary from the actual allocations. Therefore, the auditor needs to check on the variance between the actual and estimated revenue and capital allocation. In the present case, there is no high expenditure while the most of the high expenditure are isolated between 2 years that is the $360 million grant amount between 2013 and 2014. The auditor of BSF Ltd has minor concerns with respect to the estimated and actual allocation of the R&D costs. Conversion of fish based feed into plant based feed changes the low value fish into the high value fish. The most of the fish are died due to this change. The high value fish is profitable for the company. It degrades the nutritional value of the fish and makes the carnivorous fish into herbivorous. This affects the ecosystem and in turn affects the environment. Most of the seafood eaten by the human beings are generated from the aquaculture. Aquaculture acts as important seafood provider in Australia and globally and it affects the society, environment and health of human being. Most of the aquaculture industries are shifting to plant based feed, BFS Ltd. is one of them, and they have spent a huge amount of AUD. This shifting has ecological implications. It depends on the industrial crop productions, which affect the air, water and soil. Some of the are fully herbivorous and they have no problem to intake the plant based feed but the carnivorous fish like salmon is facing problem to adopt the vegetarian's food habit and they start to die. The change of source of protein changes the food value of farmed fish. The fish feed should contain appropriate amount of protein, fat, carbohydrate and minerals. Plant based feed fish are easily able to reach high weight than fish based reached. Water pollution is increased in major crop producing area. Poor people are unable to buy high value fish and sufferers from malnutrition are increased. Malnutrition is a bad thing for society. The poor children are mainly affected by this. Their future generation will also suffer from this. Malnutrition is a chronic problem. Parental consumption of these fish caused the diseases like spinal bifida, limb deficiency, cleft palate and cleft lip (). Chemical pesticides used in industrial crop production also affects the human organs like eyes, skin and systems like digestive, nervous, cardiovascular and nervous. Parkinson's disease has become a common disease whoever intake farmed seafoods fed industrial crop. The rich people prefer most luxury fish and they pay high value for it. Luxury fish production is profitable for any company. Use of vegetables oil can change fatty acid content of fish and that affect the human nutritional value (Alles, Kogan & Vasarhelyi, 2013). Food grains are produced by using pesticides and chemical ingredients. The plant based feed fish also contain these chemicals and affect the human health. Plant based feed needs more crops and to produce more crops resources are needed more which also affects the human health. Omega-3 is decreased in the plant based feed fish. To overcome these social and environmental issues BSF Ltd is started research to use bacteria to produce fish feed from chips of wood, methane gas captured from dump, food-processing plants etc. Mainly the phototrophic bacteria are used as fish feed. It can increase the protein content of farmed fish, but the weight does not differ from the plant based feed fish. Fish feed, that contains no fishmeal, tastes better and contains proper amount of omega fatty acids (Rahman, 2014). Bacteria are used as high value protein source for fish feed. Bacteria grown on natural gas methane can decrease the negative effects of vegetable proteins, which affect the stomach and intestines of human being. Therefore, the usage of bacteria in fish feed has resulted positive according to the environmentalists and the socialists. It is helpful to environment and decreases water and soil pollution caused by the industrial crop production. Patent is the core of many entities for their research and development (Vinnari & Skærbæk, 2014). Valuation of patent is done by the intellectual property management within the entity. The organisation negotiates with other entities to sell their R&D in certain price according to their value. For BSF Company the patent valuation is done qualitatively and quantitatively. Both of the valuation is appropriate for this entity. Expected net patent value for their R&D is $700 million AUD if it is sold in within two years otherwise it should be $200 million AUD p.a. The project’s rate of discount is 8% p.a. It is unique for the bacteria based feed for this entity. Production of bacteria based feed is socially and environmentally is very essential. The company is very efficient in their R&D project. Their management and team is very efficient to overcome the issues occur due to plant based feed. The reputation of company is very good and audit is less risky. 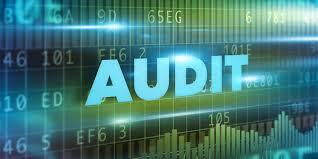 For an organisation, auditing is a main task to do and it is to be done periodically. The R&D is very helpful to overcome different social and environmental issues. The fun of research should be acquired by the reputation of the organisation. For a fish-farming entity, profit should not be the goal, human health also considered. Effect on human health may degrade their position in the market. Plant based feed can be profitable for the farm but it is very unhealthy for the poor people. Fishmeal should consist of phototrophic bacteria, which is produced from useless things of the society. Society should be cleaned and environment would be pollution free. CSIRO is the provider of the revenue to the entity. Increasing global demand of seafood force the producers to produce more products and make it hygienic. Human beings are suffering from malnutrition as the farms producing foods are focusing more on their profit not o the social health. They are less concerned about the ecosystem and forcefully changing the food habits of the species. They should focus on environment and make it pollution free to future generation. Ab Rahman, N. A., & Ramli, A. (2014). Entrepreneurship management, competitive advantage and firm performances in the craft industry: concepts and framework. Procedia-Social and Behavioral Sciences, 145, 129-137. Alles, M. G., Kogan, A., & Vasarhelyi, M. A. (2013). Collaborative design research: Lessons from continuous auditing. International Journal of Accounting Information Systems, 14(2), 104-112. Brasel, K. R., Doxey, M. M., Grenier, J. H., & Reffett, A. (2016). Risk disclosure preceding negative outcomes: The effects of reporting critical audit matters on judgments of auditor liability. The Accounting Review. 2(2), 25-120. Christiaanse, R., Griffioen, P., & Hulstijn, J. (2015, June). Reliability of Electronic Evidence: an application for model-based auditing. In Proceedings of the 15th International Conference on Artificial Intelligence and Law (pp. 43-52). ACM. Coetzee, P., & Lubbe, D. (2014). Improving the Efficiency and Effectiveness of Risk?Based Internal Audit Engagements. International Journal of Auditing, 18(2), 115-125. DeFond, M., & Zhang, J. (2014). A review of archival auditing research. Journal of Accounting and Economics, 58(2), 275-326. Griffiths, M. P. (2012). Risk-based auditing. Gower Publishing, Ltd.